Would a Republican Candidate Lie About Taxes? The United States faces a gigantic economic choice next year, and last night’s debate centered largely around what Mitt Romney would do about it. Romney’s plan is to lock the Bush tax cuts into place, reduce the long-term deficit entirely through spending cuts, enact an additional 20 percent tax rate cut that would disproportionately benefit the rich and cover the cost through unspecified closings of tax deductions. But Romney labored tirelessly, and with evident success, to portray himself in a far more egalitarian light. Every time President Obama described the cost of his tax rate cost, Romney dismissed it as untrue, pledged that his plan would not reduce the current tax burden on the rich, and even implied that he would make the rich pay higher taxes by closing their loopholes. It was a virtuoso performance. But what does it tell us about how Romney would govern if elected? Here he was making promises about how he would govern that flatly contrasted with his plans. Which promises should we believe? Ross Douthat argues that Romney’s soothing moderate rhetoric shows that he is likely to govern as the moderate he presented himself as. It’s worth considering a similar — in many ways, identical — episode that took place a dozen years before. During the 2000 election, the growth of a budget surplus offered the country a major choice. Al Gore proposed to use most of the surplus to retire the national debt and the balance for public investment. George W. Bush proposed a large, regressive income tax that Gore warned would exacerbate inequality and jeopardize the soundness of the budget. Then, as now, the Republican simply denied over and over that his plan would do what the Democrats said it would. Bush portrayed his plan as devoting just a small fraction of the surplus to tax cuts and described his tax cut itself as benefitting the poor far more than the rich. And you certainly could find circumstantial evidence to suggest that Bush might govern the way he portrayed himself, rather than the way his plan read. He had governed in a bipartisan way in Texas, he had explicitly denounced the conservative wing of the Congressional GOP, and he had surrounded himself with moderate advisers like Michael Gerson and Karen Hughes. But Bush in fact followed through on what his plan actually did, which happened to be what Gore described it as, and not what Bush described it as. His promises to maintain the budget surplus and direct most of the tax cuts to lower-earners fell by the wayside. What mattered was the party, and the Republican Party was committed to a policy of regressive tax cuts. 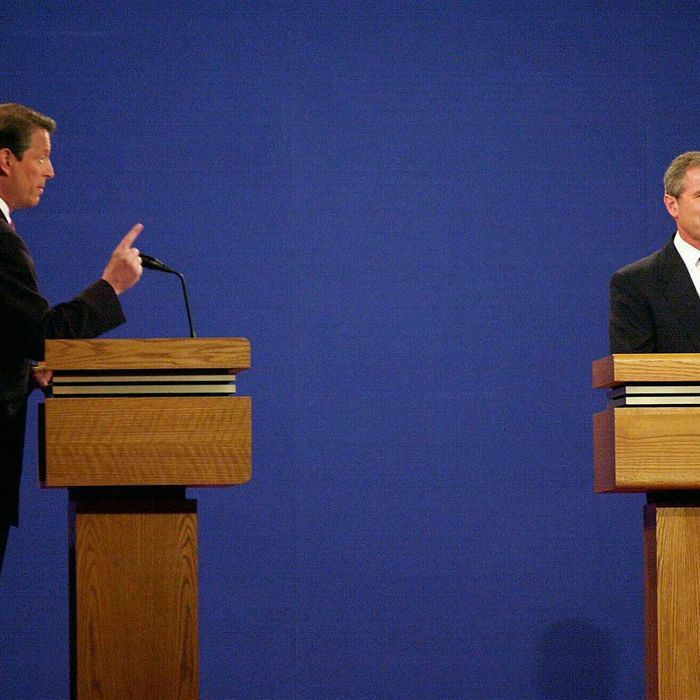 The Bush-Gore debates centered primarily around Gore’s endless, frustrating attempts to pin down Bush’s priorities. I compiled pieces of Bush denying he would pursue what turned out to be the centerpiece of his administration’s economic agenda. Let me tell you what the facts are. The facts are after my plan, the wealthiest of Americans pay more taxes of the percentage of the whole than they do today. MODERATOR: What is not true, Governor? GORE: I think that what – I think the point of that is that anybody would have a hard time trying to make a tax cut plan that is so large, that would put us into such big deficits, that gives almost half the benefits to the wealthiest of the wealthy. I think anybody would have a hard time explaining that clearly in a way that makes sense to the average person. But the top 1% will end up paying one-third of the taxes in America and they get one-fifth of the benefits. Under my plan, if you make – the top – the wealthy people pay 62% of the taxes today. Afterwards they pay 64%. This is a fair plan. You know why? Because the tax code is unfair for people at the bottom end of the economic ladder. If you’re a single mother making $22,000 a year today and you’re trying to raise two children, for every additional dollar you earn you pay a higher marginal rate on that dollar than someone making $200,000, and that’s not right. So I want to do something about that.